In addition to IdrA's return to the team, we're happy to welcome back Jake "LzGaMeR" Winstead, who was a long-time member of our StarCraft 2 team, and say hello to three newcomers: John "Chillatech" Peacock, Guillaume "Keylax" Ouellet, and Kayla "Faye" Murray. They'll all be representing Evil Geniuses at the BlizzCon Heroes of the Storm invitational, taking place in Anaheim in a few weeks. We're excited to support them at BlizzCon, and we're looking forward to seeing what they can do. I for one am super excited to see basically the entire roster of Snowflake at blizzcon. Is it too late to congratulate IdrA on returning to the competitive gaming scene as a player? Well I can't say that this was unexpected. But mind = blown. Welcome back IdrA! I'm so glad for Greg!! Go IdrA!! Him playing HOTS is making me give the game a shot, even tho I never enjoyed mobas before. Why is this showing up under SC2 news? Don't care if it's idra, he retired a long time ago. The interview was kinda shabby though, guess it just re announces him. Can't wait for Blizzcon!! Can't wait to see them play that's for sure. Idra saying he believes in Blizzard's game design, balance and philosophy. Because Idra used to be a big SC2 player and personality obviously. Someone once mentioned that the WCS region lock would bring back LzGamer. They were half right. My thoughts exactly. Always rooted for TL in the days of big rivalry between the 2...but for Hots I think Im going with EG. Good luck and have fun, never played or watched any MOBAS but having blizzards heroes makes it look fun and I actually enjoyed reading Idra's interview the other day sooo....go go EG! 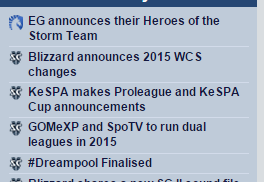 Its set to appear as general/TL news, not SC2 news. IdrA is probably the biggest reason I'm hyped for HotS. There's just so much history with the guy I can't stop being a little fanboyish. And LzGamer, it's impossible to not like that guy. I don't know about the other 3 guys at all though - should I know them from any other game? Really looking forward to see how this all plays out! Now all he needs to do is to stream on twitch again and everything is cool. Makes sense for Idra be back on EG, now that the single issue has been resolved. Skilled and well-known and supported by fans, there's nothing not to like about him, from the team and sponsors' point of view.